In my journey of awakening and living in appreciation, intuition, alignment, and purpose, I’ve observed and experienced many changes and a couple of major Life Paradigm Shifts. My life is completely changed from what it was a few short years ago. I’ve learned how to really do life and how to create my own reality (through God/Source). And I do. I always have, as we all have. But now I do it in a higher state of conscious awareness, with ease and flow, lead by inspired thought, connected with my emotions, my senses, and my desire to feel good. One example, in particular, I waited to share until I had confirmation. In June I relocated to Northern California. In Orange County, I knew at least a hundred chiropractors, worked with many of them, and had treatment with a few over the last 13 years, but hadn’t yet found a local one near me. I had had 4 semi serious car accidents between the age of 18 and 31 that had created a “spinal forward head carriage” and increasing pain in my neck. My desire to resume treatment and massage had been growing stronger and stronger. In mid October 2017, I had an experience just before I fully awoke, that was a conscious thought & image, but felt like a daydream. In it, I was rear-ended in a car accident. I watched my head slam forward and then backward. And when it slammed backward, it landed a little farther back on my spine than it had previously been positioned. As a result, my head carriage came back to normal, as it was prior to my car accidents 30 years earlier. I was beyond elated. The relief that I had been looking for was finally here, and I was so excited. On my drive South into Orange County late Halloween 2017, I had just stopped on the 405 in stop-and-go traffic. I was relaxed, and in my zone, so I didn’t see it coming. 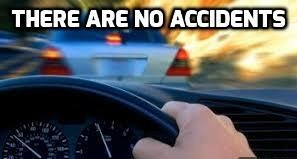 Suddenly, I heard that noise that you hear when you’re super close to an accident, or in the accident. The sound of car metal hitting hard. My head smacked forward, barely missing the steering wheel, and then smacked backward against the headrest. I wasn’t bleeding, broken, or shook up. Coherent. Alarmed, but calm. Actually, I was only worried about my Mini Cooper “Casper” (I’m a ghostwriter) that I only been driving for 3 1/2 months. The car in front of me motioned to the right that she was pulling over, right after the car that hit me did the same. And, almost simultaneously, the three of us glided effortlessly to the gore point, in one of the highest traffic areas (at the merge of the 10 freeway), at the busiest time of day, on one of the busiest days of the year. Southbound on the 405 freeway at 4:30 p.m. on Halloween. Quick as a flash, I was out with my cell phone, drivers license, insurance card, and business card, and taking pictures, before the other driver even got out of her car. Then I took a picture of her next to her car. Turns out, she was not in her zone. Or in the present moment. When she saw me and the other cars in front of her stopped, she said that she went to hit the brake, but hit the gas. The driver in front of me walked up to me and handed me her business card and said she saw the whole thing, if I needed a witness. She said she saw it coming and moved her car up a few inches to give her some space in case I crashed into her. The “accident” driver and I exchanged information and took pictures, and she told me that her insurance company would cover everything. In 7 minutes I was back on the road again. I hadn’t seen my Orange County chiropractor for 6 months but immediately called and scheduled an appointment. I stared at the x-ray. I knew. The “accident” had actually partially corrected some of my spinal forward head carriage, a result that most never experience, and that I might only have experienced if I had been through a serious full spectrum rehabilitative treatment 3 times a week for months. I felt relief, and I was excited…but in a calm way. I created this. It gets better. I have never been someone who easily drinks plenty of water, though I know and spout the importance of hydration, but about 20 minutes before the car hit me, I was inspired to down a 16 oz bottle of water that I had been given 3 hours earlier. So glad I did. My muscles got to be hydrated and relaxed for the impact. As for the impact, for years I’ve been irritated by forward pushing car seat headrests and the design of forward pushing seats on planes and in movie theaters, because of the pain that the forward pushing position caused to my neck. In my previous car, I turned the headrest backward, so it didn’t push my head, and in my car prior to that, I removed the headrest completely. I hadn’t yet adjusted Casper’s. About the driver in front of me who saw it coming and moved up a few inches just in time….Casper missed hitting her rear end bumper, by 3 inches. Casper is one tough hunk of steel. Neither the driver’s car in front of me, nor Casper’s engine and front area suffered any damage. The rear end impact missed my rear lights and only left 2 large crashed in dents in the metal. The trunk and everything else was undamaged, and I was free to drive her for the duration of my travels and my return trip home. My chiropractor is, fortunately, networked with other chiropractors all over the state and is putting her feelers out for referrals for some good chiropractors in Northern California for me. Not only do I have the opportunity to see my Orange County chiropractor while I’m here, but also some chiropractic care and massage that I’ve been looking for in Northern California, courtesy of the driver behind me. The jolt that smacked my head forward and backward was so hard, it seems impossible that it missed slamming my head into the steering wheel…and I have short legs! So, my seat is usually positioned fairly close to the front. I just remembered. Since I had been driving for hours (and I hadn’t had an adjustment in 6 months), my legs were cramping. When I got on the road after my last stop for gas, I had repositioned my seat a couple inches farther back than normal, to give my legs some room to stretch. Those couple inches saved my head. Everything and everyone you encounter is a result of Universal and God-Source principles in action. You just need to learn how it all works and begin working in it, from a higher state of consciousness, to create what you desire for your life. is the best way to create the rest of your day, and the rest of your life~your way.